BIOS is the acronym of basic input/output system, which you can use to control the basic functions of the PC. If you don’t know how to enter BIOS on Windows 10, the newest Windows system, or if you forget the ways of opening BIOS on Windows 8.1, 8, 7, etc., this is a collection of how to enter the system. After the Windows 10 upgrade, you may fail to hit F2 or other function keys to open the BIOS, because Windows 10 keeps the similar Fast Startup feature as Windows 8, which makes the way to enter BIOS is different from that of Windows 7 or XP. Use Windows shortcut keys Win + I to launch Settings. 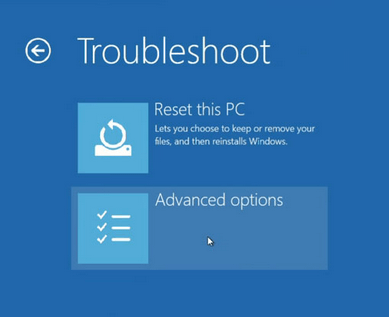 Select Update & security and then choose Recovery tab from the left column. Under the Advanced startup, click Restart Now to enter a blue screen menu. Note: You can also enter the same menu by holding down the Shift key while you click on Restart on Power menu or on login screen. 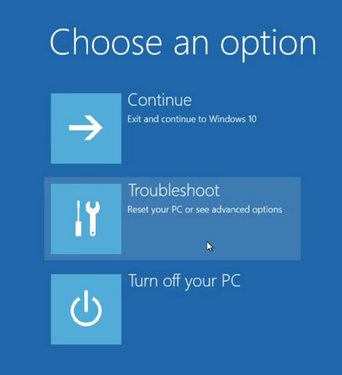 Click Troubleshoot and then select Advanced options. 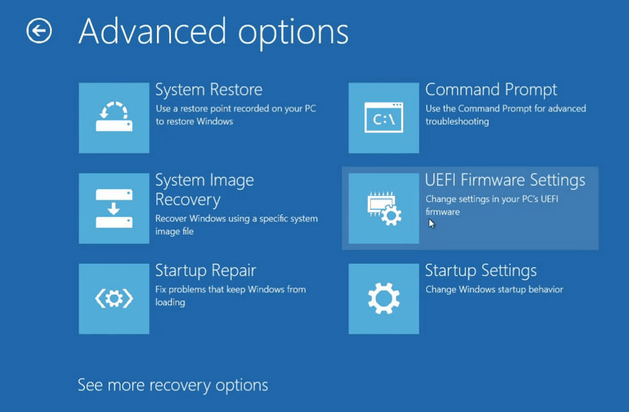 Select UEFI Firmware Settings and then click Restart. Now you are entering BIOS configuration interface. If you do not find the UEFI Firmware Settings on the blue screen, you can also enter BIOS on Windows 10 or 8 with methods below. Use Windows shortcut keys Win + X to open the Jump List and select Control Panel. Select the Power Options and then click the Choose what the power buttons do. Click Change settings that are currently unavailable and you will see the Shutdown settings below has been activated. Disable the Turn on fast startup and then save changes. Now restart your computer. When you see the Brand LOGO, hold the function key as quickly as you can. This will make you enter BIOS. When you want to enter BIOS on Windows 7 and its predecessors, if you are familiar with the brand of the motherboard on your computer, it will be easy for you to remember the function key. To enter BIOS on Windows 7 or the previous Windows OS, you need to press the function key(s) as fast as you can once you power on or restart the PC and see the brand LOGO. Here are 3 major BIOS and the function keys accessing to the system. Phoenix BIOS. It is the common BIOS used on most brands of laptop, for example, Dell. And the function key you can use to enter BIOS is F2. Phoenix-Award BIOS. Press the key Del or Ctrl + Alt + Esc to enter the BIOS. You can use the key to enter the Award BIOS of most the motherboard. AMI BIOS. The key to enter AMI (American Megatrens Inc.) BIOS is Del or Esc. Note: If you don’t know your BIOS, follow the steps below to check the BIOS style. Use Windows shortcut keys Win + R to launch Run. Type dxdiag into the box and press the Enter. 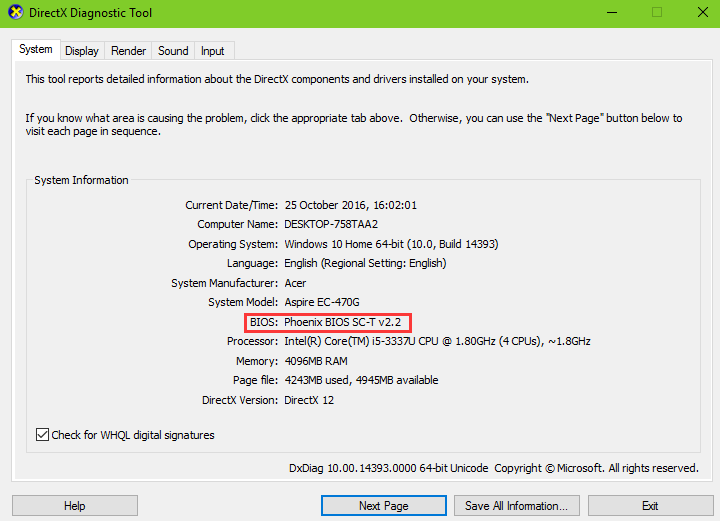 The DirectX Diagnostic Tool will pop up and you can find the BIOS type on the screen. Thank you for visiting this post. Hope it can be a reference for you to open BIOS on Windows. If you have any questions or suggestions about how to enter BIOS, please comment below this post. This is a pretty great post. I must say you have high quality posts here. Your blog should go viral. Great post on entering BIOS Setup. Even it works on my ASUS Notebook. Thanks for the comment as well. I become a problem, my boi os system not doing proper work. My PC local time is not good. Very informative post, I used this post to enter the bios setup. I was unable to enter the bios setup.I was looking for some post on the internet to resolve this issue. The information here way way to helpful and it came with image guide. Excellent! I found this post very useful. I was looking for the solution of this and I have seen this article. Finally, I got rid of this. Thanks for your comment and feedback. it. Glance complicated to far introduced agreeable from you!